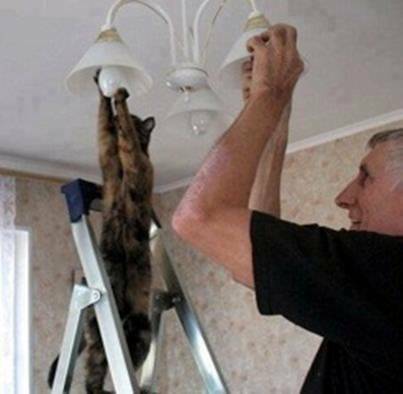 Cat helps Dad replace light bulbs. And it isn’t even the cat’s room! Okay, I’m trying to catch up here and I’ve been stuck in a cubicle farm all day. I’ll switch this out if I commit or I witness a random act of kindness. I could write about Daryl, a homeless man that I help out, but that’s not random and some people might call me an enabler, anyway. We’ll see.